WEST HARTFORD ‐ AC Automotive, Inc. has been officially Certified by Assured Performance, a non-profit consumer advocacy organization for maintaining the right tools, equipment, training and facilities necessary to repair the participating Automaker brand vehicles according to the manufacturer’s specifications. 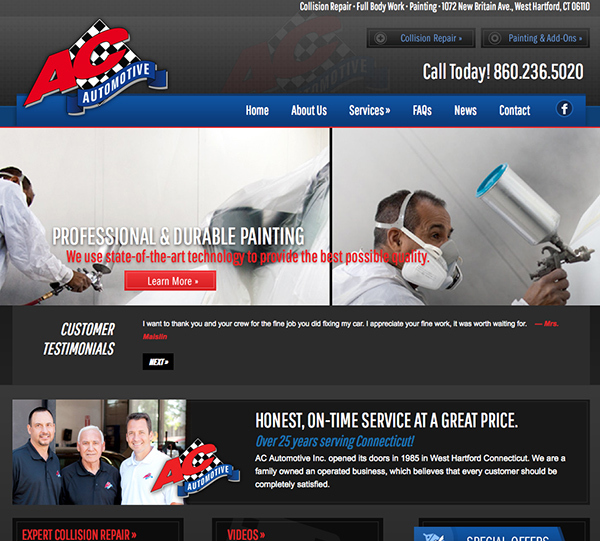 In achieving their Certification, AC Automotive, Inc. is now an integral part of the most advanced repair capable and efficient auto body repair network in the world. Adding to their credentials, AC Automotive, Inc. is officially recognized by Assured Performance, FCA, Nissan, Infiniti, Hyundai, and Kia. To become Certified and officially recognized by the various Automakers, AC Automotive, Inc. passed the rigorous Certification process essential to help ensure a proper and safe repair of the new generation of advanced vehicles. Less than 5 percent of body shops across the nation are able to meet the stringent requirements to become officially Certified and recognized. The Certified network is made up exclusively of best-in-class collision repair businesses that have met or exceeded the strict requirements of the Certification program. Proud members of the Elmwood Business Association! Welcome to our new website. Please check back to news and updates as well as specials that we will be offering throughout the year.